It their new collection, Sweet Matitos wants relive the glamour of the fifties in the French Riviera and gets the inspiration from icons like Grace Kelly in the classic movie “To catch a thief”. It’s a womenswear line full of elegance and luxurious details to wear from dress to night, with a wide selection of looks –more than 50- to dress from a stroll along the coastline to a top party in Montecarlo. As it’s usual in Sweet Matitos, the collection presents different lines. 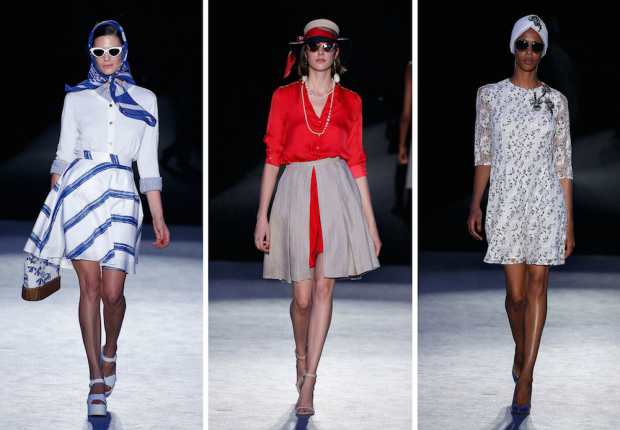 The first one distills a clear navy style, with white, blue and touches of red as the main hues in fresh and chic looks, that show that you can dress in an elegant way despite the warm temperatures thanks to the use of sumptuous fabrics and details like brooches and hats. The second line presents an afternoon stroll in Tourretes, with designs inspired in the rock and the summer flowers, romantic and delicate, mixing textures like linen, silk and cotton. The last line, named Montecarlo, brings a dazzle of sophitiscation to eveningwear with looks in beige, gold and red in the same classical elegant style of the rest of the collection.